The D.C. Council passed legislation Tuesday that would exempt renters of single family homes throughout the District from the Tenant Opportunity to Purchase Act, known as TOPA. The move would effectively stop renters from holding up home sales and extorting money from their landlords — a practice first exposed by the News4 I-Team last year. Council members hope amending the decades-old law will increase the number of affordable rental properties throughout the District and that homeowners will be free to sell their house when they want — without having to give part of the profit to their renters. Lorraine Connor (left) and Yolanda Smith (right) have became friendly during the I-Team investigation. Both told the I-Team their homes were held hostage by renters misusing TOPA. 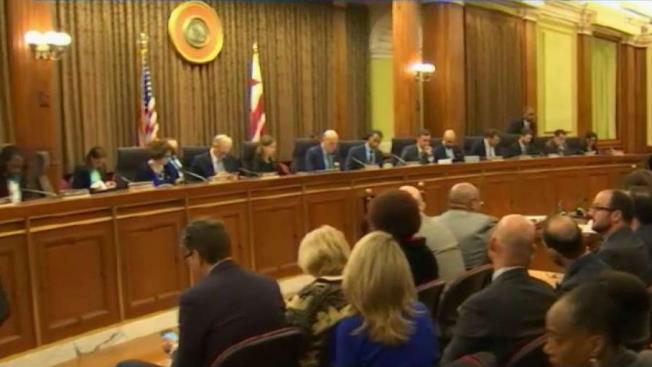 "I'm happy, very happy ... emotionally happy," said Yolanda Smith, a homeowner who attended Tuesday's D.C. Council meeting specifically to watch the vote on the TOPA amendment. The I-Team first met Smith nearly a year ago. Her home sale had fallen through because her renter, who had already moved out, said she hadn't gotten her TOPA rights to buy the house herself. "It was quite trying indeed," Smith said. "But it just goes to show when you share your story, there sometimes are others who are experiencing the same thing." The I-Team also shared the story of a buyer who lost her sale the night before closing. The property's renter wanted tens of thousands of dollars, even though that buyer was going to let the renter remain in the English basement apartment. Another property owner said she was hesitant to put properties on the rental market because she might eventually want to sell and be saddled with TOPA payments. The I-Team also featured an interview with an attorney who called the resale of TOPA rights a $100 million-a-year industry in the District. Because the old TOPA law allowed renters to hold up a sale, while claiming they wanted to buy, they could then sell that right to the highest bidder for tens of thousands of dollars. The measure passed with only two votes against it. Council members Brianne Nadeau and Elissa Silverman agreed TOPA needs fixing, they just disagreed with the rest of the Council about the best way to do it. "We need to ban this profiteering, which is extortion really," said Silverman. "We want homeowners to be able to sell their homes without being exploited or slowed down by third parties simply interested in profiting off of TOPA." Nadeau proposed an amendment to instead exempt only renters in owner-occupied homes from TOPA, to shorten the timeline for renters in single-family homes to exercise TOPA rights and to eliminate the assignment of TOPA rights to third parties. Her amendment failed and council members instead voted on the legislation as it was introduced. "I think our community as a whole is going to be better off," said Colin Johnson, D.C. Association of Realtors past president. "The Council recognized that this is impacting our community throughout the city, and I'm glad they finally took action to take care of it." The amendment, as passed, eliminates the TOPA rights for all renters of single-family homes, including homes with an accessory dwelling, like an English basement. Condos and co-ops that are in a building with a homeowners’ association are also exempt from TOPA under the new legislation. Renters who are disabled or over age 62, and entered into a lease before March 31, 2018, will still retain TOPA rights, regardless of the type of property in which they live. The legislation sets forth new deadlines for exercising those rights. All tenants will still be told the property where they live is going up for sale before it actually hits the market. "I think it has the potential to help the affordability if people can buy and sell without the worries of the TOPA regulations in the single family space," said DC Association of Realtors CEO Ed Krauze. He added that the rental market could also be improved. "Somebody might be interested in opening their basement right now who wasn't before." Members of D.C.'s real estate community gathered outside D.C. Council chambers to celebrate the TOPA vote. The real estate community rallied to support the change — creating the hashtag #FixTOPA. Realtors said they were tired of repeatedly seeing sales fall through and clients extorted. "It wasn't just one or two stories, it was 100 or 200 stories — and when you shine a light on something that's what happens," said Krauze. The new legislation is too late to help Smith with her sale, but she's proud to have helped expose the problem. "I hope that people are able to sell their properties without any disruptions," she said. Before the legislation can take effect, it must first be signed by D.C. Mayor Muriel Bowser and then approved by Congress.